Bennett-Kew Elementary School is expanding to accept sixth-grade students in fall 2019 and launching a Leadership Academy to prepare kids for success inside the classroom and out. 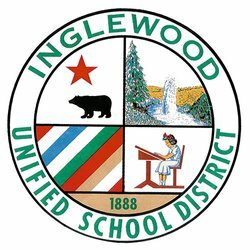 Inglewood Unified provides a safe environment where academic milestones are achieved, exploration of extracurriculars is encouraged, and goals of continuing education are accomplished. The Inglewood Promise focuses on ensuring that 100 percent of students will hit these specific academic milestones at various grade levels: reading proficiently by end of first grade; mathematically competent by sixth grade; A-G ready by ninth grade; college and career ready by 12th grade. Thelma Melendez de Santa Ana, Ph.D.
City Honors College Preparatory Academy senior Kalis Collman has been recognized as the first Inglewood Unified Stellar Student Spotlight winner for her academic prowess and will be featured in the Eye On Inglewood digital publication. Collman won the first-ever Black Panther Scholarship, sponsored by Walt Disney Studios and presented by the cast of the movie “Black Panther.” She has earned a 3.9 GPA and plans to study to become a pediatric dermatologist at Loyola Marymount University, where she has earned a full-ride scholarship. California Secretary of State Alex Padilla will visit Inglewood High School at 9 a.m. Tuesday, April 23 to speak to students about voting and the importance of civic engagement. The event will include an assembly that features voter registration. Inglewood High is at 231 S. Grevillea Ave., Inglewood. The Inglewood High School Band was presented with a trophy during a campus ceremony on April 17 to celebrate winning the annual Kingdom Day Parade contest. In January, the band marched and played its way to victory by showcasing its woodwind, percussion and brass instrument sections, along with a drumline and cheer squad. Bennett-Kew Elementary School cut the ribbon on a new playground on April 11 as students, parents and community members cheered. The playground features a slide, climbing bars and other fun features. It was donated by Carter’s Kids and American Airlines and built by volunteers from the two organizations. Bennett is updating its facilities as it prepares to expand to accept sixth-grade students in fall 2019 when it launches a Leadership Academy. Bennett-Kew Elementary School will cut the ribbon on a new playground beginning at 11 a.m. on Thursday, April 11 at the school’s campus, 11710 S Cherry Ave., Inglewood. 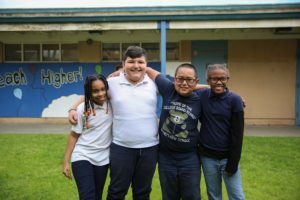 The school is updating its facilities as it prepares to expand to accept sixth-grade students in fall 2019 when it launches a Leadership Academy to prepare kids for success inside the classroom and out. Beulah Payne Elementary School held a parent informational meeting to discuss the school’s expansion to eighth grade this fall on April 3. The meeting gave parents the opportunity to ask questions about the school while learning about programs and the newly renovated campus. Beulah Payne Elementary School will hold a parent informational meeting to discuss the school’s expansion to eighth grade this fall. The meeting will begin at 5 p.m. Wednesday, April 3 at the campus, 215 W. 94th St., Inglewood. Parents will have the opportunity to learn about programs and campus renovations. Inglewood Unified has launched a new District website that offers greater insight into student achievement and provides a streamlined navigation system to connect community members to key information. The new site, www.inglewoodusd.com, was a six-month project aimed at highlighting student achievement. The new features will ultimately connect to each of the District’s redesigned school websites. Students of Inglewood Unified’s Hudnall W. Claude Elementary interacted with boa constrictors and other reptiles, scaled walls and competed in an egg drop contest during the school’s Science Explosion on March 13. The event provided lessons on science through exciting, hands-on experiences. Former Hudnall students provided a musical performance, playing electric guitars and drums to complement the day of learning. Photos are available.